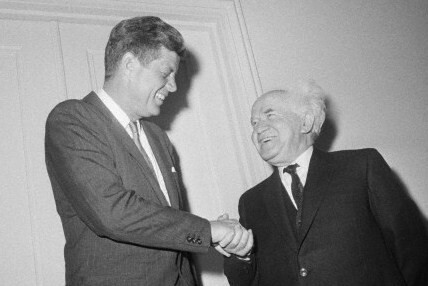 Masters of polyptoton John F. Kennedy and David Ben-Gurion. In the hands of a master, this rhetorical tool can open the mind to new possibilities. When Kennedy said, “My fellow Americans, ask not what your country can do for you, ask what you can do for your country,” he wove a strand of idealism into a generation that was coming of age in the early 1960s. Like Kennedy, Israel’s founding prime minister, David Ben-Gurion, was a fount of this kind of rhetoric. As World War 2 approached, before Israel was a state, the country’s British rulers issued the (always referred to as “infamous”) White Paper — a policy barring Jewish immigration to Palestine, just when they needed it most.That policy, along with the world’s refusal to welcome Jewish refugees to safety and the Nazi’s rather efficient genocide led to the murder of one third of the world’s Jews. It was a knotty problem for the Jews in Palestine: the British on one side and the Germans on the other. A right-wing group, known as the Stern Gang, operated in the spirit of “the enemy of my enemy is my friend.” They attacked the British and attempted to make common cause with the Nazis to try to save Jewish lives. Ben-Gurion, the leader of the Jewish community in Palestine, undid the knot. He did it through paradox. And a polyptoton. 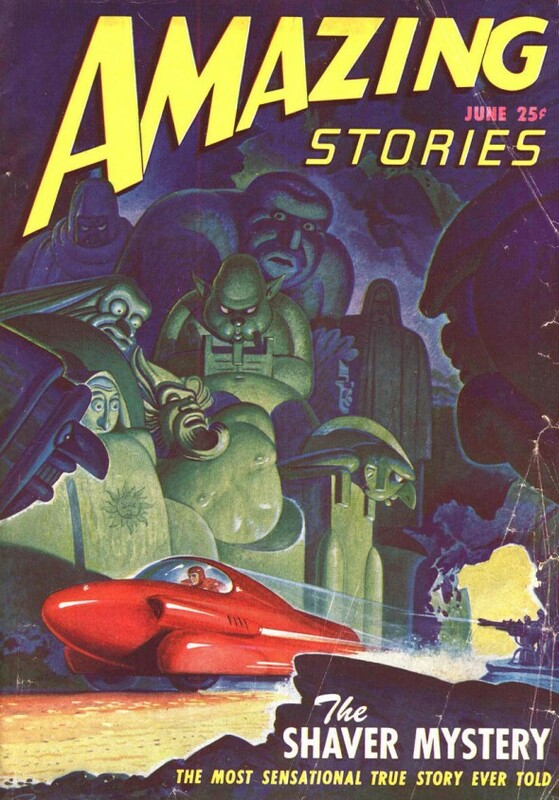 In 1943, a letter arrived at the editorial offices of Amazing Stories, a Chicago-based science fiction magazine that had prospered in the pulp fiction craze that had begun a decade before. The letter told an amazing story: In underground caverns there lived the survivors of an ancient race of people. Radiation had mutated some of them and they had become what the letter called deros, or degenerate robots. The deros had access to the machinery of the ancient civilization, and used it to affect the minds of the humans on the surface. The letter was nothing less than a wake up call to mankind to the unseen forces in our world. What made the letter different from anything else that showed up at Amazing Stories, was that the letter writer, Richard Sharpe Shaver, insisted that it was not fiction. He held that he had direct experience of the caverns and the mind-influencing machinery. For the next three years, Palmer continued to publish stories about what came to be known as the Shaver Mystery. Shaver’s claims that the tale was true and Palmer’s insistence that he believed in the Shaver Mystery’s veracity were transgressive. It smelled of a hoax and it outraged orthodox sci-fi buffs. Richard Toronto’s new book, “War over Lemuria,” looks at the controversy that split the small but fanatic world of science fiction fandom. Toronto is the editor of the Shavertron fanzine, dedicated to the Shaver Mystery. He knew both Shaver and Palmer, who died in 1975 and 1977 respectively, and other members of what was known the Inner Circle at Ziff-Davis, the publishers of Amazing Stories and other titles. This book is as much as a dual biography of Palmer and Shaver as it is an exploration of the Shaver Mystery. The associate editor, who had read the letter aloud, tossed it into the trash. Shaver appears in Toronto’s telling as a well-meaning if often-lost individual. He began hearing voices, the source of his knowledge about the caverns, in his 20s. The voices got him two lengthy stints in mental institutions, but as Toronto shows, Shaver seems to have largely weathered the auditory hallucinations like a chronic condition, albeit one that colored his understanding of cause and effect in the world. Ray Palmer was the son of an abusive father. At the age of 9 he was hit by a milk truck and so badly injured that he was expected to die. He survived but with severe internal injuries that stunted his growth and caused him lifelong pain. He compensated for his disabilities by mythologizing himself in grandiose terms and writing bombastic prose that never seemed to need to come up for air. He was part editor, part huckster. And when Richard Shaver sent his letter to Palmer, he had unintentionally found the Svengali to make the most of his tale. One of my reasons for my interest in this subject is that Richard Shaver was a relative of mine. In the 1930s, before the Shaver Mystery, he was married to my mom’s oldest sister. So parts of this book are a fleshing out of strange, old family stories that I heard in pieces through the years. Still, these chapters were hard to read. My family’s role in Shaver’s institutionalization, as seen from today, is far less than exemplary. The Shaver Mystery still circulates within the UFO, Bermuda Triangle and crop circles crowd. But are the threats these phenomena pose from without or from within our own minds?